home / Multimedia / The Holy Land in news / Pope’s visit to the refugees in Greece: “A way of ..
Pope Francis and the Orthodox Patriarch Bartholomew visited the Island of Lesvos on Saturday April 16, to meet with the many refugees gathered there. The gesture has been defined: “A strong message to both men of power and of goodwill”. 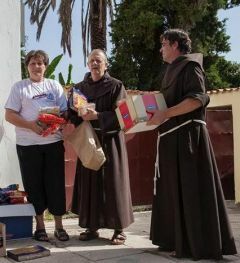 Nearby, on the Islands of Rhodes and Kos, the Friars of the Custody of the Holy Land are already working to help refugees amidst this situation of general emergency. Fr. Luke OFM, parish priest of Rhodes, tells us that “about 131,847 migrants and refugees arrived in Greece from the sea from 1th January to 7th March 2016”. They are now nearly one million since the beginning of 2015. “Most of them land on the Island of Coo/Kos, which has been defined a hotspot. For this reason, the government is going to build a new reception center that can host 800 refugees in the village named Pili, out of the centre of Coo/Kos”. Every Tuesday, more than 80 families come to the convent to recieve food parcels and basic necessities. “Lorna Anacin, a volunteer from our parish” Fr. Luke says, “begins the preparation of food parcels on Saturday to be ready for Tuesday! And the kitchen of the Monastery now looks like an hive: it’s full of boxes and bags everywhere!” Furthermore, various free language courses (Greek, English, Italian) have been started. During winter months, the support of Association pro Terra Sancta and other organizations has been essential to fund the distribution of parcels and for other activities. But this is not enough. The Friars and many Greek volunteers try to help the refugees in any possible way. Fr. Luke explains that: “Sometimes we have to go search for them by car to help them!” For this reason the Pope’s journey to Lesvos is important. 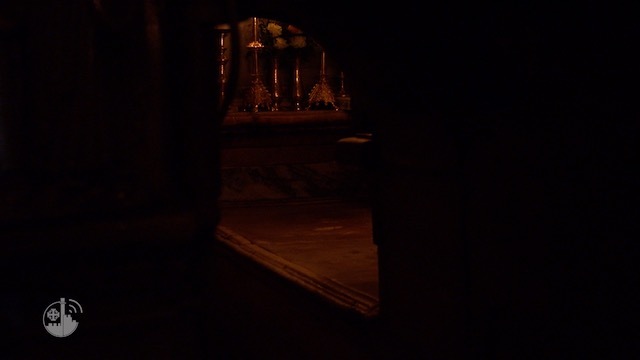 “The Pope shows us the way” Friar Luke comments “a way of Mercy that we must follow”. Support the refugees from the Middle East now!